Make the most of milk with these quick yet delicious milkshakes. Simply blend milk with fresh fruit and ice cream to make an indulgent, creamy drink. Semi-skimmed milk contains only 1.7 per cent fat. For a more creamy version try whole milk which is still only 4 per cent fat. Finely chop 4 strawberries and reserve. Roughly chop the remaining strawberries and blend in a liquidiser or food processor with the ice cream. Gradually add the milk. Stir in half the finely chopped strawberries and pour the milkshake into tall glasses. Decorate with finely chopped strawberries and serve immediately. Blend the banana slices and ice cream in a liquidiser or food processor until smooth. Gradually add the milk. 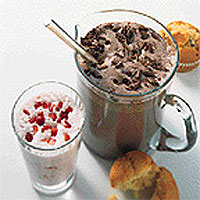 Stir in the chocolate chips or grated chocolate and pour the milkshake into tall glasses. Sprinkle a little grated chocolate over the top to decorate and serve immediately.